Dear students A warm welcome to , the Institution dedicated to Civil Services Examination preparation and specializing in GENERAL STUDIES. has made great strides over the years in providing education of the highest quality and in developing tomorrow's leaders. Over the last three decades has emerged as one of the leading institutes in India with the vision to be the Centre of excellence and the mission to develop innovative and ethical future leaders. The work of bureaucrats is becoming increasingly complex. Today's environment, characterized by disruptive politics and technology; increasing integration of the world's economies; and major social changes all over the world , particularly India, is extremely complex. Therefore those who aspire to become tomorrow's leaders will need to acquire specialized knowledge, skills and attitudes. Teaching for the Civil Services Examination demands renewal on a continuous basis. Information and developments bombard the candidate from all sides. Making sense from the UPSC (Constitutional body) perspective is a demanding task. Most students and even more so, teachers fall short for this reason. We never did. Nor will our students. The reason is simple: We have long experience in teaching. We are committed and sincere. We do not rest on our past laurels. EVERY CLASS IS A CHALLENGE FOR US. The process of preparation is stretched over approximately 2 years. It begins with mastery over all the subjects that make up General Studies. Every class has a lot to take away for all three steps in the exam process: Preliminary, Mains and the Personality Test (Interview). The focus of course is on Prelims and the Mains. The one question that I am flooded with most often is: Sir, give me a strategy for success. Which optional to opt and when to start the preparation for optional" With my decades of experience as teacher and mentor to the budding Civil Servants, let me clear it up for you. Generally, students take a plunge into the preparation just after university education, where they are not used to go through the rigours of information gathering, sorting, prioritizing, understanding, presentation and improvisation. Therefore, in every class, the faculty discusses the given chapter in a manner that it should appeal to a good , inquisitive, above average, young and determined student. Conceptual clarity, current applications and India-centeredness, where necessary are the elements of such a discussion. Dumbing down never helped anyone. So we always leave room for discussions. Thus, my friend, your successful preparation starts with being regular for every class, being in step with faculty, reading the newspaper daily as indicated by me, diversifying your knowledge base as we go along etc. About the Optional. Very simple: Once your General Studies foundations are strong, Optional has to be started. Otherwise, you will find the balance difficult. Why General Studies first? Because it carries 1250 marks and Optional is only 500 marks. Optional needs time to understand and basic foundation can be laid with the help of GS classes, at least for some popular subjects. Therefore, don't select the Optional in a hurry and on hearsay. 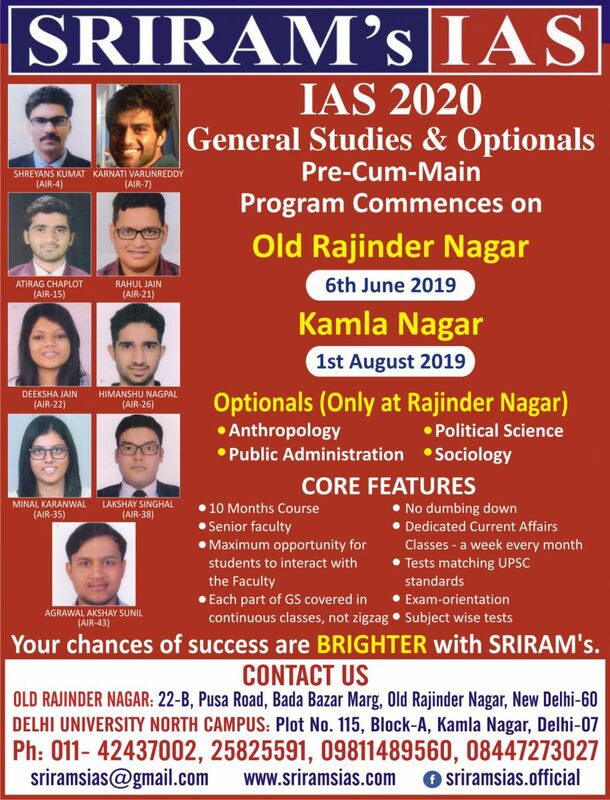 Secondly, if you have studied a subject at undergraduate or post graduate level and it figures in the UPSC's list of Optional subjects, you are lucky. Opt for it. The exception can be a technical student seeking a social science subject or literature. Otherwise, you need to get to know the field of Civil Services Examination preparation. It may take a few weeks or months. Therefore, in the NEW SYSTEM, optional preparation has to start after you have dug into General Studies. In simple terms, under all circumstances, well almost all, G.S classes are the kickstarter. Never go by hearsay. Apply your mind, be logical and finalise the optional. It can otherwise play the spoilsport. Once you are at , there are no differences between students from the so called prestigious educational institutions and others. WE WILL LEVEL THE FIELD FOR YOU. REST ASSURED.